Preparing for a move is quite a bit of work. From finding somewhere to live to make sure that everything is lined up for a smooth move, it can be overwhelming just to think about. While you’re stirring over when you will find the time to get your home packed up, you begin to think of not just your belongings, but your children’s belongings as well. If moving wasn’t enough to worry about already, you have to worry about of your children as well. It can be difficult to know just how much your children should help you with the move, as it can be dangerous for them to be around. Consider these tips from our moving company to help you pack it up and ship it out as a family. Teach Your Children What Fragile Is – Before getting started with your packing, talk to them about what fragile means, and which items are breakable. Suggest leaving those items for you to pack so that they don’t get broken. Prepare Their Boxes – Set aside the boxes that are meant for their rooms. Label them with your child’s name with room as well. From there, create boxes that can be for specific items such as “toys,” “school,” and “athletic gear.” They can make packing their items in each box into a game. Reward Them – It’s important that your children are getting their packing done in a timely manner. If they get their boxes packed and organized within the right timeframe, reward them with ice cream or a trip to the park for a break from packing. 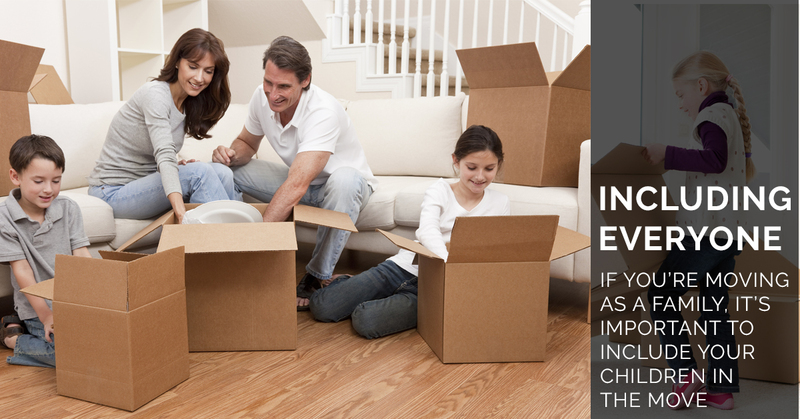 If you’re moving as a family, it’s important to include your children in the move, as it is their life change as well. Take these tips from our moving company, and make your move a fun and exciting experience for everyone.